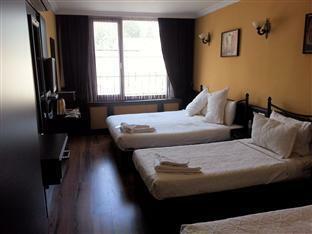 ﻿ Arasta Boutique Hotel Istanbul. JIMAT di Agoda.com! Ada soalan mengenai Arasta Boutique Hotel? Sesuai untuk berehat dan bersantai, Arasta Boutique Hotel terletak di area Sultanahmet di Istanbul. Hotel ini terletak 5.0 Km dari pusat bandar dan menyediakan akses kepada kemudahan bandar yang penting. Syurga untuk berehat dan bersantai, hotel ini akan menawarkan pembaharuan penuh hanya beberapa langkah dari pelbagai daya tarikan bandar seperti Mevlana Rug House, Troy Rug, 5K Rug Store. Menawarkan tetamu hotel perkhidmatan yang unggul dan pelbagai kemudahan, Arasta Boutique Hotel komited untuk memastikan penginapan anda berada di tahap seberapa selesa yang mungkin. Khidmat bilik 24 jam, Wi-Fi di tempat awam, khidmat bilik, pengangkutan lapangan terbang, bilik keluarga merupakan beberapa kemudahan yang membezakan Arasta Boutique Hotel daripada hotel-hotel lain di bandar. Semua penginapan bagi tetamu menawarkan kemudahan yang difikirkan dengan teliti bagi memastikan rasa selesa yang sukar ditandingi. Di samping itu, pihak hotel menawarkan aktiviti rekreasi untuk memastikan anda mempunyai perkara untuk dilakukan sepanjang penginapan anda. Temui gabungan yang menarik antara perkhidmatan profesional dan pelbagai kemudahan yang ada di Arasta Boutique Hotel. I have reserved a delux room with view but finally a room under the staircase is allocated to us. The room is noisy as it is at the entrance floor. The bed is uncomfortable with a broken lamp. More serious, one night of our stay is out of water supply (tap and flush water) as the hotel pump got enginee problem. Under rainy and cold weather, we finally moved to other hotel down the street without any compensation. except for the location, nothing at all. To forget about. To begin with, the night staff was absolutely useless, oblivious to any query. Didn't speak english or french, barely speak at all in fact. The day employee had no manners, spent the whole day lying on a couch watching TV and even found a way to be rude at one point. The hotel was noisy (no sound proofing). No curtains in a (large) window, bad smells in the bathroom, old bedding with holes everywhere and a dirty carpet full of hair that they didn't bother to shake out or vacuum. The staircase was narrow and steep, a suit case could barely fit in it and the lighting took so long to switch on that you were in sheer darkness long enough to tumble down. And the view on the Bosphorous! You could see a bit of it, the size of a fingernail tip, far away on top of dumpy backyards (photos available). 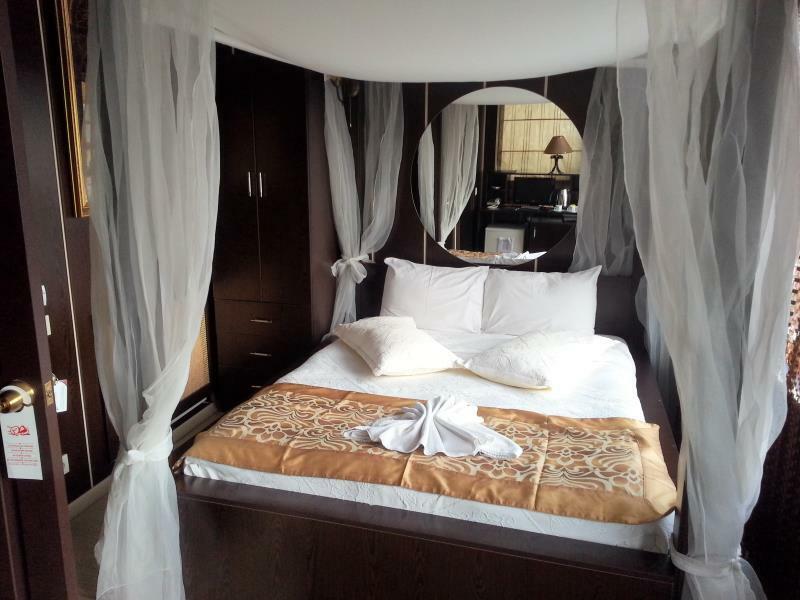 Finally, the advertised price, allegedly cut from more than three hundred dollars to less than100 dollars/night is somehow ludicrous and looks like a scam rather than a real bargain. Stayed one night at this hotel as my first accommodation in Istanbul. Only 5 minutes arrive at this hotel, I feel the perfect view already. Got a room at the top floor which is 4th, regardless no lift at this hotel, but the staff is more than happy to lift all our luggage to our room. Okay our room has the best view through the ocean which is located at the back. And if I go out from my room, I got the perfect view of Blue Mosque. The room isn't huge, but very comfy for a boutique hotel. All surrounded by windows offering the best view. Got breakfast at 70TL for 2, they serve a very good bread here. Will stay at this hotel the next visit for sure. Great location. Had young kids and they enjoyed themselves. It's a tidy neat room with basic features but if you intend to do much sightseeinging the excellent location makes it a great base. You can easily reach 4 to 7 of the top 10 main Istanbul attractions within a 10-30 min walk. There's also a good Chinese and Korean restaurant nearby which makes a change from the numerous kebab restaurants you'll encounter. Wifi is patchy at times. On our first night they put us in a double room and pulled out a single bed as they had obviously overbooked. This was the main issue we had with them but barring that for the remaining 8 nights they kept the room fairly decent though it was basic. The staff were very friendly. Overall it was fine. Luckily we didn't bring a pushchair/buggy if you did for a young family the room would still be manageable but tight. Attentive hotel staff including the hotel GM Mr Andreas since the first day of communications makes this stay a truly memorable one. Mr Andreas was very helpful and sincere in entertaining my questions. First choice of hotel if be back here again. Very helpful staff, they tried their best to assist us in every opportunity to ensure of our comfort and pleasure stay.. location is great as well.. when i go again to Istanbul definitely i'll stay there again. Avons été extremement déçus par la prestation. Photos très trompeuses sur le site agoda. La chambre du rdc et du 1er que nous avons eu étaient extrêmement sombres et la "room with view" se solde par une vue sur des immeubles délabrés et des gravas. Chambre petites. Au rdc mauvaise literie, vous sentez les ressorts et en prime vous pouvez vous laver les dents assis sur la cuvette des wc. Cependant malgré la vétusté de l immeuble, c est propre et le petit déjeuner est copieux. A ce prix là préférez une pension ; 67 € avec le petit dej c est cher pour la prestation. Un peu surprise au 1er abord ... je ne m'attendais pas à un hôtel d'aussi petite taille et aussi ancien ! Au demeurant, l'accueil y très sympathique et la propreté n'est pas à remettre en cause. Une vue splendide sur la mosquée bleue, un accès privilégié à tous les centres d'intérêt touristiques de Sultanhamet. Le petit déjeuner est correct. Le seul vrai bémol : le bruit dans l'hotel (les chambres ne sont pas super isolées et les portes des chambres ne sont pas épaisses ... on entend tout ce qui passe à droite à gauche). Hôtel agréable et propre destiné à une clientèle jeune et pas trop exigeante en matière de confort.